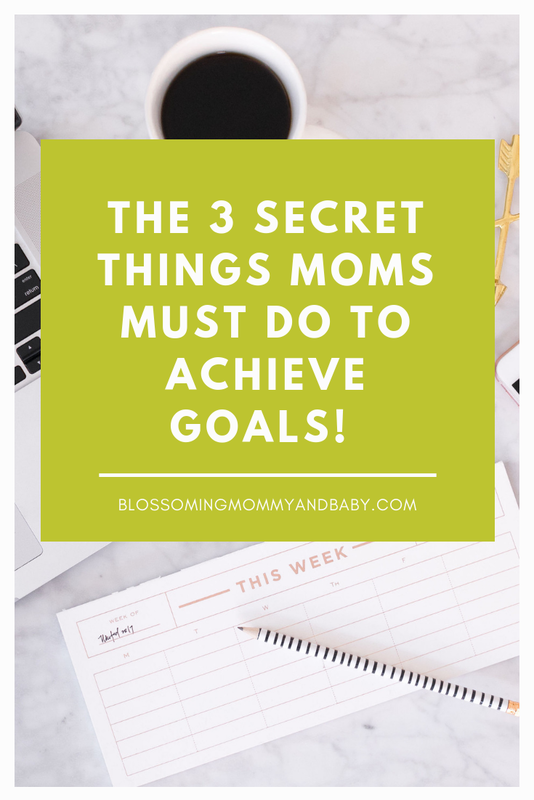 The 3 Secret Things Moms MUST DO To Achieve GOALS! On the go today?! No worries, Momma! Grab your cup of coffee and tune in to today’s blog post in audio format on The Blossoming Mommy And Baby Show (on iTunes or Stitcher)! We are officially ONE MONTH into the New Year and that means it’s time for us to pause and reflect on the goals you set for yourself for 2019! I truly believe that when we are intentional with our actions, thoughts, and ambitions, we can create the life and Motherhood we long for! How incredible is that!! When it comes to goal setting, unfortunately, most people brew up lots of great ideas but never lay down a plan of action to actually BRING THOSE PLANS AND DREAMS TO FRUITION! This approach is like throwing a dart at your goals and seeing what will stick….. and spoiler alert…. most times this approach is not going to be super successful! My philosophy to goal setting is simple and effective. In fact, I’ve created a system that has proven time and time again to be SUCCESSFUL and I’ll be letting you in on 3 of those secrets today! Let’s get that dial moving UPWARD in your life, chica! Remember, it’s the small, daily actions that make a BIG (permanent) change in your life! I don’t believe in small thinking and I believe that God has placed a dream and desire in your heart. Now it’s between you and Him to find those dreams and to share it with the world! One of the greatest gifts YOU can give yourself as a mother is GRACE. When it comes to setting and achieving your goals, grace is HUGE because well… life happens and sometimes (errr… all the time) the journey to actually achieving YOUR goals is never LINEAR! As I teach in my postpartum program~Blossom After Baby, it’s more about you moving your dial forward EVERY SINGLE WEEK. The little wins. The little successes. The little victories that no-one else sees, THAT sweet friend is what matters. Don’t throw in your towel just because you’re NOT as close as you want to be. If you’re closer this week than you were last week, you’re on the right track! Remember, it’s a marathon, not a sprint! Wow, right!! How powerful is this thought! Honestly think with me for one sec…. how much time are you spending in your past and how much time are you spending in your future? Now ask yourself how much time you are spending in the NOW? It is so important to assess how much of your mental energy is spent in these three divisions! Don’t get me wrong, you should most definitley be thinking about your past and future, just don’t live there. I see so many moms stuck in the past or dreaming of the future that the ability to truly be PRESENT and enjoying the moment NOW is missing. If this is you, I’ve got you friend. Try refocusing your energy on being more present and truly living each day to your fullest. Just start small and remember that the BMAB approach to motherhood will help you narrow down your focus to making good choices mentally, physically, emotionally, spiritually, and of course within your homemaking journey. So tell me, are you on track with your goals this year? Let me know in the comments or over on Instagram and be sure to hop on over to continue this conversation in our private (moms only!) Facebook group here and if you REALLY want to take your goal setting and enhance your postpartum journey to experience the healthiest and happiest version of Motherhood (EVER), download your copy of Blossom After Baby and get started TODAY!